What’s the Difference Between Romneycare and Obamacare? That’s a trick question, of course, as illustrated by this biting Henry Payne cartoon. But let’s look at one of the commonalities of Romneycare and Obamacare – higher premiums, thanks to mandates and third-party payer. 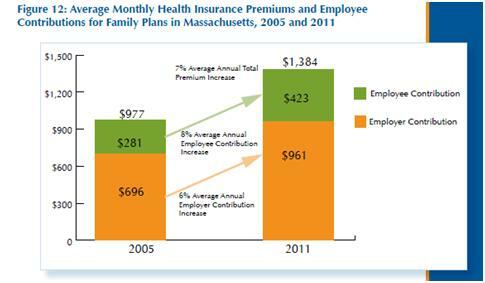 Here’s a quick look at what’s been happening to premiums in Massachusetts. The same thing is already happening with Obamacare, as explained in a Wall Street Journal column by Merrill Matthews and Mark Litow. The congressional Democrats who crafted the legislation ignored virtually every actuarial principle governing rational insurance pricing. Premiums will soon reflect that disregard—indeed, premiums are already reflecting it. …Guaranteed issue incentivizes people to forgo buying a policy until they get sick and need coverage (and then drop the policy after they get well). While ObamaCare imposes a financial penalty—or is it a tax?—to discourage people from gaming the system, it is too low to be a real disincentive. The result will be insurance pools that are smaller and sicker, and therefore more expensive. Many actuaries, such as those in the international consulting firm Oliver Wyman, are now predicting an average increase of roughly 50% in premiums for some in the individual market for the same coverage. …Arizona, Arkansas, Georgia, Idaho, Iowa, Kentucky, Missouri, Ohio, Oklahoma, Tennessee, Utah, Wyoming and Virginia will likely see the largest increases—somewhere between 65% and 100%. Another 18 states, including Texas and Michigan, could see their rates rise between 35% and 65%. 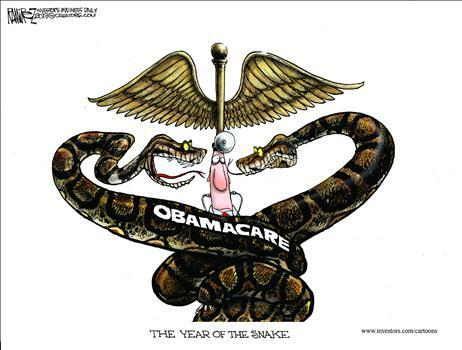 Which is why 2014 is the “Year of the Snake” in more places than just China. If you like Ramirez cartoons, you can see some of my favorites here, here, here, here, and here. Not a whole lot of difference. SO healthcare insurance premiums in Massachusetts where the gov’t runs healthcare went up 40% in 7 years? Did I get that right? And 4 of those years we have been in a recession? Sounds like they are really doing a bang-up job making healthcare affordable. US healthcare was already in that no mans land of economics: Too regulated and too collectivized already for market dynamics to work, yet not completely regulated and nationalized, which enabled various interest groups to rent seek through political action. By electing Obama, The American People have clearly shown in which direction they intend to “solve” this conundrum: Eventual complete nationalization. Which is all consistent with flatter effort-reward curves, less production, loss of the already thin competitive margin over the rest of the world, economic distress, more desperate attempts at recapturing lost standard of living through redistribution and subordination of economic activity to collective management, more HopNChange. Rinse, lather, repeat as the decline accelerates further and further. It is in the vicious cycle that lies the American prosperity Armageddon. Of all the HopNChange mandates towards more obligatory collectivism, ObamaCare represents the most definitive entry into the vicious cycle. To France! And beyond!… to where France is going … and where it will be in twenty years. After many years suffering in the empire of selfishness, the American moths have finally seen the European light. It’s too late. By the time the European moth’s wings start burning on the light, it will be too late for American HopNChangers to turn back. And contrary to prevailing belief, the mandated CFLs burn the wings of freedom a lot faster than the banned incandescents. But who knows? Little understood mysterious forces bordering the supernatural may keep the USA on top. Have hope, it may all work out in the end. HopNChangers will keep working and we can all enjoy a life of a lot more leisure. I’m getting ready to vote for my next package of free stuff and fairness. America has inexhaustible energy. Americans are different. The more you tax them, the more you insulate them from the consequences of mediocrity, the more they work. Finally, for the first time in human existence, the hippie dream is about to materialize: Less incentives to work, more prosperity. “The result will be insurance pools that are smaller and sicker”. That’s better than our banking sector where mortgage pools were bigger and sicker. Either way, the Gov’t can print more money to pay for it. sarcasm. Not necessarily. The federal constitution says that all powers not specifically enumerated in the constitution remains with the people and the states (the 10th amendment–more dishonored in the breach than honored in the observance, to paraphrase Hamlet). I have no idea what the constitution of California says, or that of Taxachusetts, or New York. If those constitutions allow for the state to mandate state-run health care, then that is a problem for the people in those states. However, and this is the big issue, they can move out of California without having to apply for a visa to another country, without changing citizenship. We’ve seen this in the recent Phil Mickelson dust up. Indeed, Tiger Woods left California for Florida back in the late 90’s, I believe. Further, people who think state-run health care is the greatest thing since sliced bread, they can move to those states that have it. The fact that progressives are not content with individual states choosing or not choosing state-run health care indicates one of two things (if not both): a complete lack of faith in state-run health care, or an ulterior motive, namely, controlling the lives of the citizens of the whole country. The same could be said for someone WITHIN Socialist Republic of California, what if they don’t want to pay for CaliHealth or whatever whimsical term they (or any other state) have? The jurisdictional properties remain. Counties everywhere should start standing up for what they believe, just as states should to the Feds. Paul is right. Another reason why we need to repeal the 17th amendment to restore the balance of power to the States. Here’s the difference between Obamacare and Romneycare: I simply don’t care one whit if the folks in the People’s Republic of Taxachusetts want to have goverment funded healthcare or not. But I do care if government funded health care is forced down my throat. New York can have it if they want; California, too. But if I wanted Romneycare, I’d move to one of those socialist soviet republics; my continuing to live in South Carolina is an indicator that I don’t want their help with my life. But the federal government taking over health care is a violation of my Constitutional rights, and it should not be.